That’s how the saying goes and like everything else, it’s 100% true. Meal prep takes planning and time but the reward is much greater than the time you spend in the kitchen. Apart from loving the taste of the food J and I make, I love knowing exactly how it’s prepared. And not just that; meal prep is so much more cost efficient! You can make yourself lunch and dinner for 4-5 days for the price of 6 take-out lunches. In order to be efficient and not feel overwhelmed, J and I get our grocery shopping done on Friday evening or Saturday afternoons. Friday evenings are actually the best; the grocery stores are empty, the produce is restocked and everything is fresh. We always go in with an idea of what we want to make. How many meals are you prepping for? For how many people? What veggies or proteins are you having that week? These are all the things you need to ask yourself. There’s nothing worse than walking into a grocery store with no game plan. Have you ever been in a grocery store while hungry and unsure of what to make? b) will end up in the garbage. Buy ONLY what you need and know you’ll use. I hate wasting food so buying what you need helps reduce the amount of food that goes to waste. 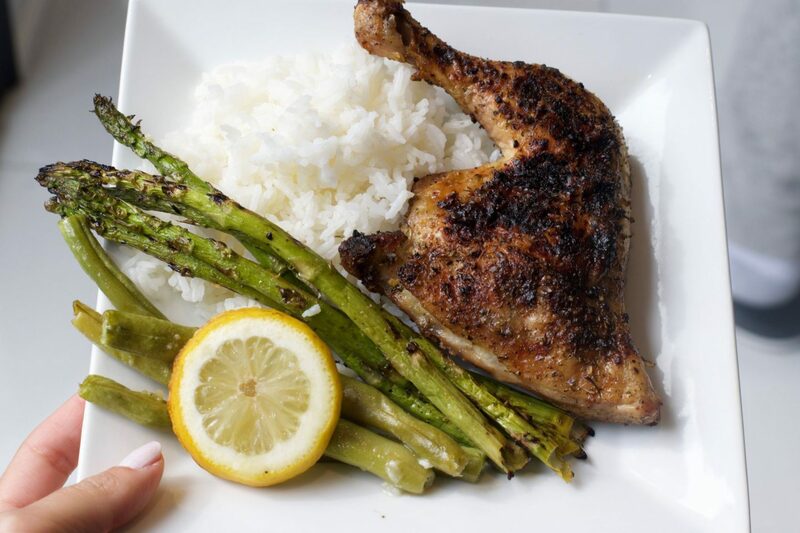 For J and I, our meals usually have a carb – for me it’s either rice or sweet potato, a protein -again, for me it’s usually chicken, shrimp or fish; for J its chicken, steak and minced meat. When it comes to vegetables, we buy what we like and usually vegetables that are packed with nutrients; we usually buy our faves which are asparagus, broccoli and peppers. My grandparents (mom’s parents) were farmers who, 20-30 years, found creative, natural ways of protecting their vegetables and cleaning them. One of them was using white vinegar (a natural disinfectant) to clean the produce. Always, always, always wash your veggies (and fruits). Let them soak in water (2-1) water and vinegar for 45mins- 1hr. This ensures that you wash off any pesticides, herbicides & dirt. While soaking your veggies, clean and season your protein. J loves to cook and is a pro at seasoning our proteins. There are great seasoning mixes at the grocery stores, just make sure that they’re not loaded with sodium. We also wash our chicken and fish. Does anyone else do this? If you’re making sweet potato, peel, dice (large chunks) and season with extra virgin olive oil, salt and pepper. Sweet potatoes are great for roasting and can be be thrown on a sheet with the other veggies. Alternatively, you can wash them, leave them whole and wrap them in aluminum foil and bake them in the oven. This takes longer but it’s easier than peeling, dicing and seasoning. For any other carb, you want to keep it simple. If you like rice (I love rice) the easiest way to cook it is with a rice cooker. It cooks perfect every time! One of the easiest ways to prep is to do sheet-pan dinners. What does this mean? Throwing everything onto a sheet-pan and cooking it all at once. I mean, it doesn’t get easier than this. If you have a BBQ (which we do and J loves using) you can cook your proteins there. Lately we’ve been doing rotisserie chicken and this takes about 1 1/2 hours to cook on medium heat. 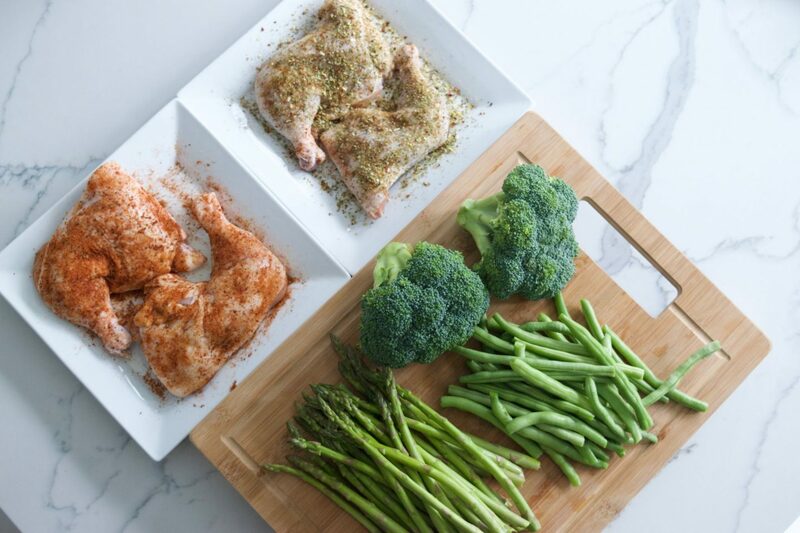 If you’re doing a sheet pan dinner, set the seasoned protein aside. Rinse the veggies that have been soaking in the water and vinegar making sure to get most of the water off. Season them how you like (make sure to add a little extra virgin olive oil) toss them on a sheet-pan with your protein & chopped sweet potato (or whole one). *Add a little water to the sheet pan so your veggies and sweet potato don’t burn. Set the oven to convection at 350º (to cook all the way around) and leave for 30-40 mins. If you like your veggies to have some crunch, remove them before the 30 minutes and leave the rest to finish cooking. While your food is in the oven you can clean the mess you’ve inevitably made in the kitchen. The longest part of this all is the prep. It can be enjoyable if you prepare well and play some music while in the kitchen. I always have music going, my EarthLuxe diffuser on and sometimes even enjoy a glass of wine. As you do this more often, you’ll find that it begins taking less time. So while this may take you 2-3 hours to do, in those 2-3 hours you’ve made yourself and your partner or family, food for the week that is healthy, inexpensive and saves you from having to decide what you’re having the next day or even having to make a whole new meal when you get home from work. The best part? You can remix this food in any way you want! You can make healthy bowls; add a few seeds and sprouts to jujjj it up. Don’t want a bowl? Make yourself a wrap – Grab your protein, veggies, add some hummus and you have another healthy meal. The options are endless and meal prepping ensures that you have lunch and dinner ready to go for a few days! Let me know if you’d like me to show you what I make out of our meal prep and let me know how you meal prep!